The layout of your kitchen is one of the most, if not the most, important components of your kitchen remodel. Since kitchens often undergo so much usage, it is important that the work flow is efficient and works for your needs. Some experts say that a no-fail solution to efficient kitchens is the “work triangle.” The work triangle was developed in the 1940’s to examine the efficiency between the three major kitchen appliances: the refrigerator, sink, and stove. 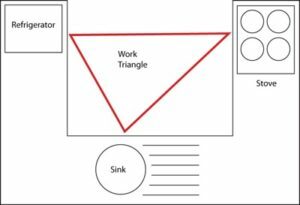 The “work triangle” is a great tool to use when planning your kitchen layout. The materials and finishes you choose will largely depend on your budget and personal preferences. Some major decisions that need to be made for a kitchen remodel include: countertop material, cabinetry, and flooring. Material options can dramatically range in prices, so it is important to do your research on each option. Some popular countertop materials include granite, quartz, laminate, concrete, and marble. Flooring options range from ceramic tile, hardwood, linoleum, vinyl, among many others. Cabinets are also available in a wide range of materials including: solid wood, plywood panel, aluminum, wood veneer, and polyethylene. Kitchens require lots of light for safety when cooking. Along with adding safety to your kitchen, lights can set the tone of the whole space. Like cabinets, flooring, and countertops, there are many lighting options for your kitchen. A good option for kitchens are several can lights, pendant lights over a bar/breakfast bar area, and under-cabinet lighting. Lighting is also a good way to make some energy-efficient choices through choosing LED or fluorescent bulbs. Finishing touches can make or break a space. Some finishing touches to keep in mind are: paint color, seating options, backsplash, as well as other decorative items. A good rule of thumb is to contrast your cabinet color with your paint color to add some dimension to your space. For example, a dark paint color paired with dark cabinetry could leave the room feeling too dark. Create the illusion of more light by choosing a lighter color. The same concept applies to your backsplash. Your backsplash should contrast with your cabinet and countertop, as well as add visual interest to the space. Don’t be afraid to steer from subway tiles and choose a more decorative option. The finishing touches of the space are a great way to let your personality shine through. There are many factors that have to be considered in a kitchen remodel, including: layout, materials, lighting, and the finishing touches. 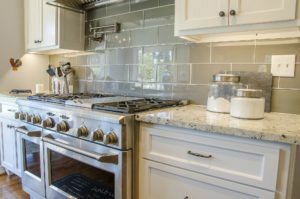 A kitchen remodel can be an overwhelming and stressful project if it is not planned out, which is why it is important to get a professional’s opinion and guidance. If you are considering a kitchen remodel for your home, feel free to call Balducci Additions and Remodeling to schedule a no-obligation appointment.